Our new understanding is transformed into Truth with the aid of Divine Agency. The work we do Below is Balanced by an effort from the Above. Truth we receive from Above comes as a revelation of Knowing. Thinking and reasoning are unlikely to precede a revelatory experience. Revelations, by definition, are thoughts that come spontaneously through the heart, mind, and body. A Revelation is Truth we Know in every fiber of our being. Serpent/CHICCHAN represents the Spark of our Spirit that can be felt by our Physical Being. The Dragon is a symbol of Enlightenment and Illumination, offering the Gift of “Seeing Clearly.” Today we have an opportunity to Acknowledge our Gifts. When they are Seen, we’ll be raised to a Higher Perception of Discernment. Our Spiritual Gifts lie dormant until they are Known and Acknowledged. The Elders always said that Everything wants to be Seen. Today we have an opportunity to see our Gifts. They can be Awakened by Conscious Intention to be Present when the Experience happens within us. We were Intended to Know our Gifts and Capabilities. Of course, this is how we would want to live in a new world, knowing we are Capable of our Dreams. When we question our thoughts enough, we’ll arrive at something Higher. We’ll discern our Mission and Purpose, our Higher Reason to be that transcends “right” or “wrong.” Knowing will help to keep us discern the Choices that lead toward our Dream. Like most of our Spiritual Experiences, we don’t notice the significance unless we are paying attention. We miss the significance because it’s a common experience. We fail to see the gift we have without the patience to think about it. Our Spiritual Gifts are “everyday” Senses. Tone 9 will complete a Transformation of our Personal Power to Master our Dreams. The Serpent grows by shedding its skin. So are we given the power to shed the skin of limitation so we can grow into the Truth of our Spiritual Identity. CHICCHAN is the most powerful Day Sign of “lightning in the blood,” our Sixth Sense. We can spend a lifetime hoping for a Savior, someone else who makes everything right. We’re sure that someone else, can draw upon a Power beyond our Own. We make do, because inside we don’t believe what we want is possible, or we’re afraid of the Unknown. These are all perceptions of our Ego, our lower self. When we Believe and Trust in our own Intuition, we won’t have to defend our decision. We are given unlimited choices. We can choose what Feels Right when we Receive the Justice of Divine Intervention. CHICCHAN can ignite our Consciousness to our Sacred Right to Choose, and the Purpose that will lead to our Harmony and Happiness. To all my relations, may we be Conscious of a Divine Energy that touches us today. May the experience complete a Truth that holds the Power of Transformation. When we experience it, may we Acknowledge it for what it is by having the Patience to look deeper into our own experience. 9 comes with a warning of suffering if we don’t pay attention. The suffering we can eliminate is a burden we already carry, the burden of believing we are merely a Human. May we see through an illusion of powerlessness to create the place we can grow. As CHICCHAN brings a Gift of Spirit, may we position ourselves to Receive it. P.S. This is an important time to separate your own thoughts and feelings from those around you. 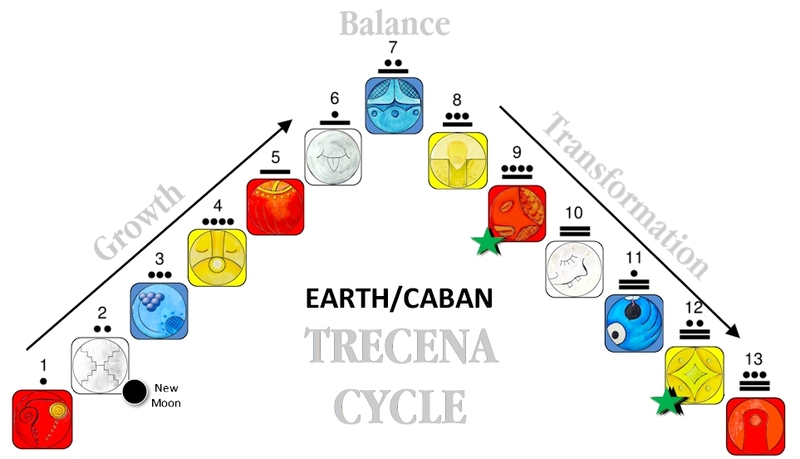 The Earth trecena calls us to take care of our Body, Mind and Spirit. We claim the truth of our thoughts from outside thoughts. I’m grateful for the Spiritual Experiences we can feel to acknowledge as True. Thank you for this, Debra – very interesting about all the 9’s coming together! I really enjoyed your insight into the meaning and symbolism of it. Just noticed another 9/9 in the 9th uinal lands on a new moon.